The computing revolution has bestowed upon its pioneers, considerable abundance. They saw the coming tech boom, and found clever ways to monetize it. 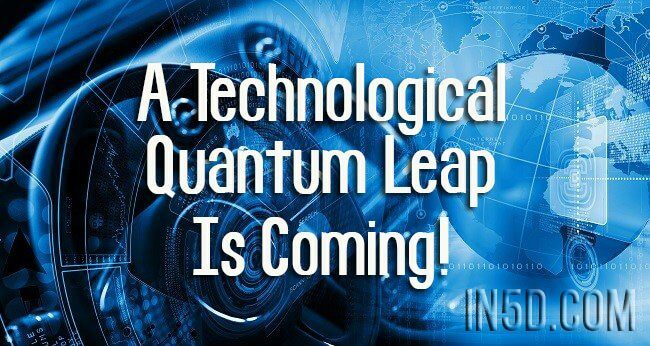 The quantum computing revolution is about to unfold. The advances made by silicon based computing will utterly pale in comparison to the windfall of knowledge to be gained through the use of quantum computing. A golden opportunity awaits those who are on the bleeding edge of co-creation. We can only begin to fathom how profoundly life on earth will change over the next few decades. Rapidly increasing knowledge has afforded us the opportunity to come together for the purpose of co-creation like never before. But a few centuries ago, we believed our celestial orb to be the center of the solar system. A few centuries before that, we thought it was flat. So much has changed in the past century. Our technology is outpacing our biology, and that trend is unlikely to slow. Soon, anyone will have the ability to traverse infinite parallel realities; a feat now reserved as the realm of mystics, and science fiction. And we thought we were alone. Ha! Not only are we not alone in this vast cosmos, there are an infinite number of iterations of each of us, individually existing in slightly different, to wildly different realities. If you ascribe to the many worlds interpretation of quantum mechanics as I do, this presents some very interesting possibilities for quantum computing. Have you ever wanted to be President, Batman, or maybe a unicorn? Theoretically, there are an infinite number of realties. There’s even a reality where you are a unicorn, President, and Batman all at the same time. Anything and everything you can imagine is possible. Through the power of quantum computing, those flights of fancy can be brought to fruition; a portal to your own personal paradise! Quantum computing is fundamentally different than computing as we know it today. Theoretically, the computing speed is unlimited. A quantum computer with a sufficient number of q-bits (a lot fewer than you might think) is capable of representing anything and everything simultaneously. For instance, with a mere 300 q-bits, it would be possible to simulate every particle in the known universe. What if, the entire cosmos was in fact, a quantum super computer writ large, with an infinite number of virtual universes existing inside of it? Already, in the world of traditional computing, virtualization is being leveraged to squeeze the maximum potential efficiency out of existing silicon based hardware. By breaking the old one-to-one ratio of computer to operating system, it is possible to have many virtual computers operating simultaneously on a single physical machine. One of the key features of this virtualization is the ability to take snapshots of the computer, and its storage anytime something changes. This provides easy means of recovery to a specific point in time should a fault occur. I.e. there are many possible versions of the original computing resource existing simultaneously. The snapshot’s are composed of delta data, only information that has changed since the last full backup was made. There are limits to this virtualization imposed by computing speed, memory and storage capacity, and data transfer latency. These limitations do not apply to quantum computing, as the ‘processor’ instead of being composed of transistorized silicon, is a q-bit composed of atoms in super position. Several atoms are entangled to create the q-bit, allowing for input/output, error correction, and state query. When in super position, the atom is in all states simultaneously (the full set). Only when the q-bit is queried for its state, does it collapse into a specific state of being. The q-bits can be quantum entangled with other q-bits, eliminating data transmission latency, allowing instantaneous communication from across the room, to across the universe. This phenomena still has physicists scratching their heads… And probably will for some time. One of the first developments from quantum computing will be that every encryption system currently in operation today, is compromised. Everything from the stock exchange, to photos of your nethers will be up for grabs. Quantum computers will be encrypted via entanglement. This entanglement allows for far more advanced and efficient encryption than we currently have. Due to the nature of quantum entanglement, it is tamper evident, and only the intended recipient will be able to read the data. If someone else attempts to read it, the entanglement is broken and the data lost. Future communications will be both instantaneous, and highly secure. This is but a stepping stone in the transition from the additive programming process used on binary computers now, to the subtractive process that must be employed to programming quantum computers. Our current iteration of data encryption relies on prime numbers factored together with a seed. Silicon based computers can’t calculate prime numbers very rapidly, making it difficult for an attacking computer to guess passwords encrypted with a prime. Due to the unlimited processing power of quantum computing, determining those prime numbers is exceedingly trivial when you ask the question in the right way. Programs written today are based upon a set of rules beginning with the empty set. The programmer is required to build something from nothing; A logical structure engineered for a specific task. By contrast, quantum computing begins with the full set. It requires a very different set of rules in order to move from the full set, to something of sufficient specificity to provide a result that is of any use (in a traditional sense). By changing the way we think about programming, even a relatively simple quantum computer will have unimaginable computing power. Programmers of the future will be able to create an infinite number of infinite virtual realms; Even providing physical access to those virtual realms via quantum portals. This fundamental difference in programming philosophy, literally opens the door to limitless possibility; An infinite stack of virtual and physical representations of third dimensional ‘reality’, all existing simultaneously atop a fourth dimensional space-time continuum. This in turn, exists within fifth dimensional space. Physicists postulate there may be as many as eleven dimensions, or more. What we perceive as our third dimensional physical reality, is likely only one virtual snapshot of an infinite spectrum of possibilities. The next major technological development on the horizon is true A.I. True A.I. will never be achieved on silicon based computing. Traditional computers are very good at true/false questions. They are binary in nature. They are not so good at maybe’s. In order to process irrational numbers, silicon based computers require billions of transistors and a special piece of kit called a floating point unit to represent non-whole numbers in calculations. This is why our silicon computers are exceptional at doing math, but rather poor at composing music. Life, is not black and white; It is full of maybe’s. Quantum computers, do binary logic extremely poorly compared to how well they can be programmed to do maybe. This indefinite nature, allows programmers to endow the program with the ability to make choices, based upon probability; raw, natural randomness. When the A.I. we create is paired with the unlimited power of quantum computing, it will eventually become considerably more intelligent than its creators. This invites some very intriguing philosophical questions. Whose intelligence will be artificial then, mmm? If we are already living in a virtual universe, perhaps the intelligence we have now is in fact, ‘artificial’. More and more people are coming around to the idea that we indeed may already be denizens of just such a virtual universe. A matrix if you will; perhaps something along the lines set forth in the Hitchhiker’s Guide to the Galaxy. It postulates that our world is itself, a quantum computer. All the matter and energy that compose it, every quark, atom and molecule; all those who live on/around Earth are part of a computer program designed to determine the ultimate question. Have you ever wondered ‘Why am I here? What does it all mean? What’s the bloody point?’ Of course. You, along with a lot of other individuals, have pondered such questions for as long as we have had sufficient cognitive faculty to entertain existential musings. Perhaps beings at a higher plane of consciousness are still looking for answers, and have successfully harnessed quantum computing to both ask, and answer these ‘deep thoughts’. Collective consciousness willed itself into existence as a singularity through the Om, the statement ‘I Am’. The divine spark that ignited the big bang and gave rise to this physical reality that we currently inhabit. What did it think next? Probably something along the lines of ‘Well, I’m here… Now what?’. Perhaps, that is why we are here. We are the cosmos attempting to know itself. If this article has piqued your curiosity, Veritasium has made an excellent video describing in further detail how quantum computing may work. It is still highly experimental technology, as it is difficult to keep the atoms entangled. And, there is a long way to go in quantum programming theory. But, maybe ‘someone’ will give us a hand with these hurdles. After all, in less than a hundred years we have gone from computers that took up several large rooms, to a super computer you can fit in your pocket. If you want to get in on the ground floor of the next technological revolution, this is it.